Do you usually buy your groceries in a single shopping trip each week? Are there large stacks of fruit and vegetables on display at the grocery stores you frequent? Do you compost your food scraps? Do you frequently forget to eat leftovers before they’ve gone bad? Do you eat meat? If so, is beef a staple of your diet? If you answered yes to several of these questions, then your foodprint – the ecological footprint of the food you consume and/or discard – is probably significant. Food waste is one of the most important environmental challenges we currently face. Because of this, the 2013 UN World Environment Day theme was food waste and reducing your foodprint. Why does your foodprint matter? And why is food waste a problem? Worldwide, 30-40% of food is wasted across all levels of the supply chain, from farm to fork, both in developed countries and developing countries. That amounts to about 1.3 billion tonnes of food wasted yearly. In developed countries, like the US, most of the waste is produced near the end of the supply chain, at retailers, food service providers, and in consumers’ homes. Grocery stores overstock food, which goes bad and gets disposed of before it can all be sold. And in countries like the US and the UK, we are making fewer and fewer trips to grocery stores each year, which results in more food waste: the more frequently you shop, the better you plan, the less food you buy that’s likely to go uneaten. In developing countries, like India and Kenya, most of the waste occurs at production or because of poor refrigerated storage available during the distribution process. Figure 1, below, shows what percentage of food gets wasted, by food type, for the USA, Canada, Australia, and New Zealand, collectively. Figure 1: Percentage mass of food wasted, by food category, in the US, Canada, Australia, and New Zealand, collectively (NRDC). Last year, the United Nation’s Food and Agriculture Organisation produced a report finding that if food waste were a country, it would be the third largest carbon emitter in the world after the US and China. The amount of CO2-equivalent emissions produced by the world’s top-emitting countries and food waste is summarized in Figure 2. This amounts to more than twice the total greenhouse gas (GHG) emissions from all road transportation in the US in 2010. These numbers take into account both the wasted GHG emissions from production for food that is ultimately not consumed, as well as the methane emissions, one of the strongest greenhouse gases, produced by uneaten food rotting in landfills. The foods that produce the largest carbon footprint are meat, especially beef. If beef is a large component of your diet, this is also a large contributor to your personal carbon footprint. Figure 2: Carbon footprint of food waste compared with total carbon footprint of the world’s largest carbon emitting countries (FAO). GHG emissions are concerning because, as they build up in the atmosphere, they cause global climate change, which has severe effects around the world. These effects include killing off the coral in coral reefs, raising average global temperatures as well as making extreme weather more prevalent. Global climate change can also have a negative impact on food production because of the extreme weather conditions it produces, such as droughts. And it’s especially a problem for developing countries, such as those in Asia, so many of which depend on rice crops for food, which are extremely sensitive to temperature fluctuations. Food production also requires a significant amount of water, and thus has a high associated water footprint. 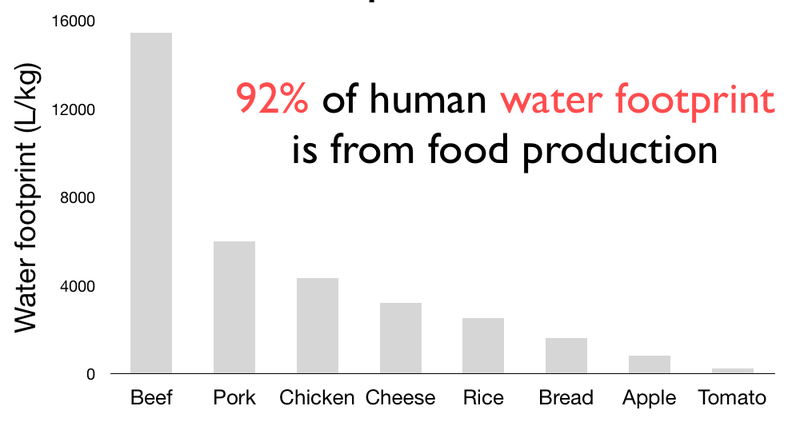 In fact, 92% of the human water footprint is from food production. Figure 3, below, summarizes the amount of water needed to produce different foods, from tomatoes to beef. Beef consumes the greatest amount of water for production: you’d be better off eating one less hamburger a week than taking shorter showers if your goal is to reduce your water footprint. Other meats, like chicken, also have a high water footprint, especially compared with the water footprint of fruit and vegetable production. When we waste food, we are also implicitly wasting the water that was needed to produce that food. How do we stop food waste? A real solution to reduce food waste means reducing system-wide food waste. For example, if a grocery store were able to reduce its food waste by persuading its consumers to buy its food when it is close to expiry, this may not be a system-wide solution. It would reduce the retailer’s food waste, but if the food would go bad too quickly – that is, before it could be consumed by the consumer who bought it – then this would not have reduced system-wide food waste. It would have merely off-loaded the food waste onto the consumers. Reducing system-wide food waste means improving supply chain operations: the more quickly and efficiently we can get food from the farm to the fork, the less likely it is to decay and expire before it can be consumed. But the obvious solutions may not be the best solutions. Two potential “food waste solutions” that have received the most press in the last couple of years are food redistribution and food recycling through anaerobic digestion and biogas production. When we talk about food redistribution, we usually mean taking uneaten, edible, food that would otherwise be thrown out, usually at grocery stores or in restaurants, and redistributing them to people in need, such as at food banks. There are even Silicon Valley startups developing apps to help make food redistribution easier. Although food redistribution is a piece of the food waste puzzle, it’s not a long-term sustainable solution. It would be problematic if food banks began to rely on grocery stores to produce waste in order to feed the hungry. The other often touted solution to food waste is to divert food scraps from landfills to anaerobic digester facilities to produce biogas, a renewable energy source. San Jose recently opened an anaerobic digester/biogas production facility, and these are going up around the country and around the world. While this prevents food waste from producing methane emissions by rotting in landfills, it could cause more systemic problems. Because biogas is profitable, biogas production facilities are willing to pay for food scraps to feed their anaerobic digesters. But putting a value on food waste could actually incentivize farmers, retailers, distributors, and potentially even consumers, to increase their food waste production. At minimum, it would start to eliminate some of the economic incentives for curtailing food waste. If this did cause an increase in food waste, this could also cause an increase in food production, which could ultimately result in a system-wide increase in carbon emissions. This could be exacerbated by the current trend for legislative incentives for renewable energy, which would further increase the value of food scraps and could unintentionally increase the amount of food waste produced. Although we’re still a long way away from having a comprehensive solution to drastically reduce food waste, we are on the right track. Many grocery stores, like Andronico’s, are starting to sell imperfect or blemished fruit at a lower cost, which would have otherwise gone straight to the landfill. It also helps to raise awareness that food need not be blemish-free to be tasty or edible. More and more cities, from San Francisco to Princeton, are starting to offer organic waste collection, which, at minimum diverts food from heading to landfills, and is part of the solution. And Massachusetts has implemented even more radical policies: starting in October, there will be a ban on commercial food waste while all other food waste gets composted. And at the national level, the USDA has instituted a food waste reduction campaign to help individuals and communities to minimize food waste. We may not see food waste numbers dwindling greatly by the end of this year, but we’re on the right track. More and more work is being put into reducing food waste. And the more awareness that the issue gets, the more effort we’re all likely to put into food waste reduction, the closer we get to achieving zero food waste. Alexandra Heeney is a 2011 fellow of the Fulbright Science & Technology Award, from Canada, and a PhD Candidate in Management Science and Engineering at Stanford University. How will East Africa address its food crisis? – Shop for groceries more than once a week, buying only what you need until your next shopping trip. This will help prevent over-buying. – Plan your meals before you buy your groceries. – Be wary of very perishable foods, like strawberries, which are among the most wasted foods in the US. If you buy strawberries, makes sure you store them properly and eat them as soon as possible. – Reduce the amount of meat you eat, especially beef: meat is the biggest contributor to your foodprint. – Learn how to store food properly and make sure you follow these directions, including keeping your refrigerator at a low enough temperature. – Separate your organic waste from your other waste. This will also help you track how much food you waste: you’ll probably be surprised by just how much it is, and this can help you curtail your waste. – If you live in a city that provides organic waste collection, like New York or San Francisco, make sure you make use of it. If organic waste collection is not available, investigate your options for composting. If you have some thoughts about the data and visualization, please leave a comment.